In large bowl, beat all filling ingredients with electric mixer on medium speed until creamy. Place filling in 1-gallon resealable food-storage plastic bag; refrigerate while making cups. Heat oven to 425°F. On lightly floured work surface, unroll pie crusts. Sprinkle each crust with turbinado sugar and cinnamon. Lightly roll rolling pin over sugar and cinnamon to press into pastry. With 2 1/2- to 3-inch round cutter, cut out pastry rounds. Lightly press each pastry round into ungreased mini muffin cup. Bake about 10 minutes or until pastry cups are golden brown. Cool completely in pans, about 15 minutes. Remove from muffin cups to cooling racks. Just before serving, remove filling from refrigerator. Cut 1 bottom corner off bag; pipe scant tablespoon filling into cooled pastry cups. Sprinkle with chocolate chips and powdered sugar. Serve immediately. Store any remaining pastry cups at room temperature and filling in refrigerator. Cups should be filled shortly before they’re eaten so they don’t get soggy. If you wish to make them ahead of time, you can make the cups and the filling, just keep them separate. Once you’re ready to serve, you can fill, decorate and serve. For a variation in the filling, try 1/4 teaspoon of almond extract or orange extract instead of the vanilla. 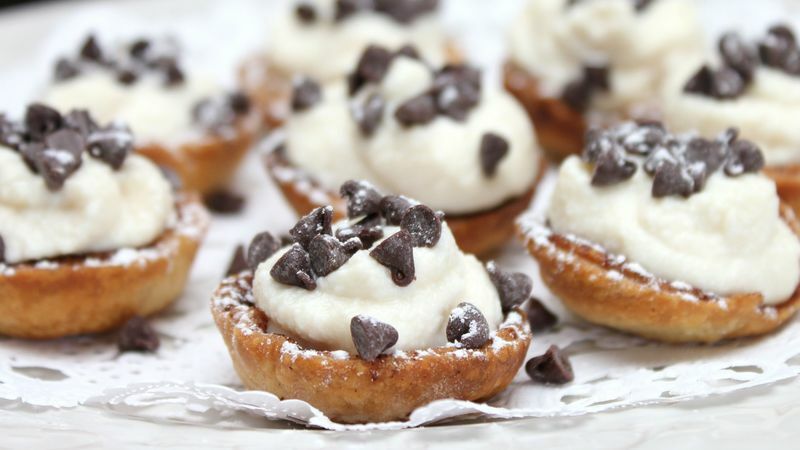 Other toppings that go well with the cannoli cups are chopped toasted almonds, chocolate candy sprinkles, candied orange pieces, chopped candied red cherries, as well as a sprinkle of cinnamon.